Mar 8 15:07: Magnitude recalculated from 4.9 to 4.8. Hypocenter depth recalculated from 603.0 to 604.0 km. Hypocenter depth recalculated from 604.0 to 603.0 km. Mar 8 15:38: Magnitude recalculated from 4.8 to 4.7. Hypocenter depth recalculated from 603.0 to 606.0 km. Mar 8 15:40: Magnitude recalculated from 4.7 to 4.8. Hypocenter depth recalculated from 606.0 to 608.0 km. Hypocenter depth recalculated from 608.0 to 607.0 km. Mar 9 11:46: Magnitude recalculated from 4.8 to 5.0. 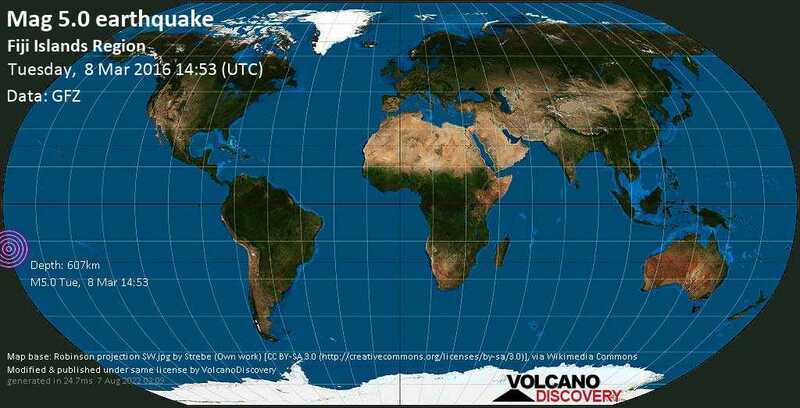 Mar 16 03:00: Magnitude recalculated from 5.0 to 4.8. Mar 16 10:50: Magnitude recalculated from 4.8 to 5.0.